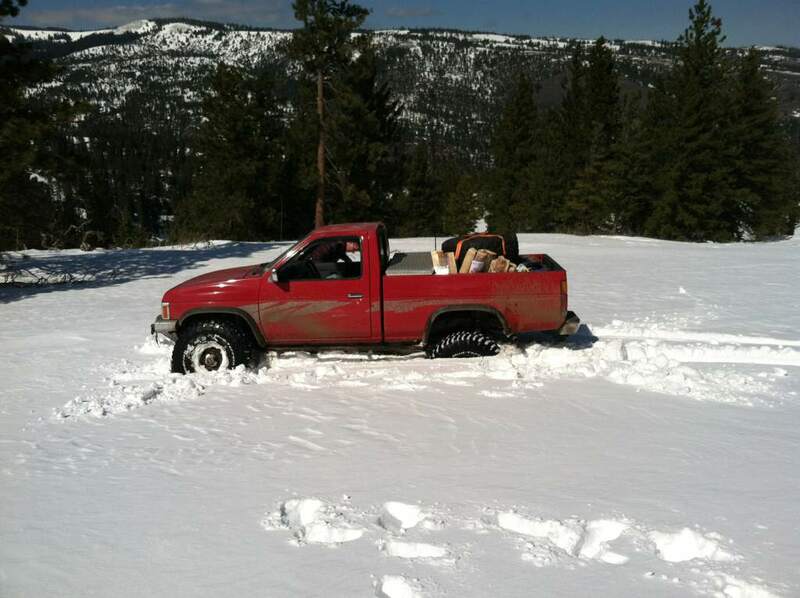 Offroading in the snow tips? Hey guys so tomorrow I will put my Hardbody to the test and take her into the snow. I'm a desert rat so I've never actually driven on snow before. I got traction mats, a working 4lo/hi, 31in Cooper all terrains in good condition, just replaced all bushings and control arms with energy and moog parts. toolbox w/ sockets. food and water for 48 approximately 2 days, hi lift jack, spare tire, shovel and probably a bit more that I'm forgetting. Is there any tips ya'll can pass on so i won't get stuck? Kinda nervous here. Recovery strap, kitty litter or tube sand for traction and weight. Depending on snow depth skinny tires are actually better. More PSI on the contact patch and they dig through the snow. Don't go near trees. They tend to make soft pockets near them. Don't stop. If you must stop try to pack down the snow in front of and behind you so you can build momentum again. If you are not in deep stuff treat it like slippery sand covered asphalt. Ok I can get a recovery strap today same for the sand/kitty litter, couldn't I use my traction mats for that instead though? Juts found out that the snow is about 6.5in deep where i'm going. Is that alot? Dude that's badass, how deep is that snow? it's gotta be at least 2.5ft right? Those tires loom like they're 33-35's? 6.5" isn't bad. I would probably just cruise around in 2wd in that. I've taken my truck in snow over the hood. The kitty litter or sand is really good on ice. Floor mats may help but sand gives you weight over the axles and can be used for traction. If someone else has a recovery strap you can use theirs if one of you needs a pull. I usually carry a recovery strap anyways. I've used it more in the city than the woods. Otherwise, easy does it. No sharp throttle, brake or steering inputs. It'll probably want to push when you turn at speed and the back end might want to step out. 35s and there was a slope coming up and let off the gas too much and sank. Ok cool I'll def remember that. 6.5in of snow not being bad is making me feel more at ease. Thanks man! Got any more pics of this adventure? A few. I'll have to look for them on the home computer.